Stereotactic radiosurgery is related to the history of "radiotherapy" and "stereotactic neurosurgery". The concepts for neurosurgeons and radiooncologists have been changed during the last decade and have also transformed neurosurgery. The gamma knife and the stereotactically modified linear accelerator (LINAC) are radiosurgical equipments to treat predetermined intracranial targets through the intact skull without damaging the surrounding normal brain tissue. These technical developments allow a more precise intracranial lesion control and offer even more conformal dose plans for irregularly shaped lesions. Histological determination by stereotactic biopsy remains the basis for any otherwise undefined intracranial lesion. As a minimal approach, it allows functional preservation, low risk and high sensitivity. Long-term results have been published for various indications. The impact of radiosurgery is presented for the management of gliomas, metastases, brain stem lesions, benign tumours and vascular malformations and selected functional disorders such as trigeminal neuralgia. In AVM's it can be performed as part of a multimodality strategy including resection or endovascular embolisation. Finally, the technological advances in radiation oncology as well as stereotactic neurosurgery have led to significant improvements in radiosurgical treatment opportunities. Novel indications are currently under investigation. The combination of both, the neurosurgical and the radiooncological expertise, will help to minimize the risk for the patient while achieving a greater treatment success. The term "radiosurgery" refers to a combination of principles and methods derived from "radiotherapy" and "stereotactic neurosurgery". Stereotaxy is defined as "operating in a 3-dimensional space with precalculated directions (trajectories)". The history of stereotaxy is closely connected to the history of neurosurgery itself. Already in 1908 Horsley and Clarke developed the first stereotactic apparatus in order to precisely locate the cerebellum of the rat. They included coordinates from countless brain sections for orientation within the skull. The next milestone was the development of a stereotactic system in humans by Spigel and Wycis in the late 1940's, designed to treat movement disorders in humans for the first time. Herein, help-structures like the foramina of Monroi, the pineal gland and both the anterior and posterior commissure were defined as targets in the basal ganglia by means of pneumatocephalograms . Finally, Lars Leksell and Traugott Riechert, and also Robert and Wells established frame based stereotactic methods on the basis of coordinates of linear computertomography data. This technique remains the gold standard for stereotactic planning up until now [18, 94, 112]. However, with the introduction of new imaging modalities new frame materials, i.e. titanium, carbon or ceramics, became necessary . Importantly, the introduction of image fusion software has enabled the use of combined imaging techniques, i.e. CT, PET, SPECT, MRI, which further improved the quality and precision of stereotactic techniques [15, 79, 146, 153]. However, despite the significant progress in the diagnostic accuracy of modern imaging modalities, the histological determination of brain pathologies remains necessary in most cases, especially if a radiosurgical treatment is planned. Reasons for the failure of stereotactic radiosurgery in achieving an adaequate tumor control include an inadequate visualization of the tumor, a lack of intraoperative 3-D (volumetric) imaging, or an insufficient or limited dose (e.g. due to proximity to the brainstem) [21, 29, 33, 47, 51, 58, 68, 145, 154]. The principles of radiosurgery were developed in 1951 by Leksell. This technical realization led to the development of the gamma knife and the stereotactically modified linear accelerator (LINAC). The gamma knife and the LINAC are radiosurgical equipments used to treat predetermined intracranial targets through the intact skull without damaging the surrounding normal brain tissue. 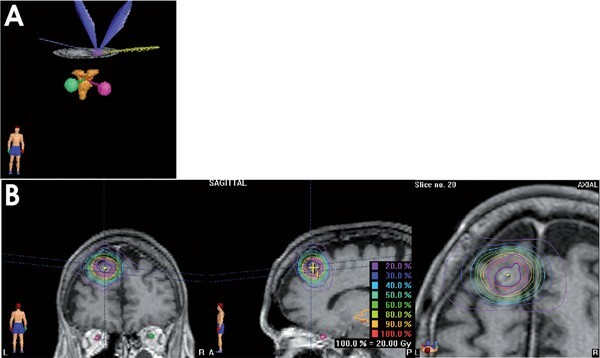 Gamma knife radiosurgery involves the stereotactic target localization with the Leksell frame and subsequent closed-skull single-treatment session irradiation of a lesion with multiple highly focused gamma ray beams produced from 60Co sources. The hemispherical array of sources, the large number of small-diameter beams, and the steep dose gradients surrounding a targeted lesion bear the complexicity of the physical characterization of the radiation field. LINAC systems appear to be advantageous in terms of cost, the variety of collimator sizes available and the sophistication of computerized dose planning. Currently, further improvements in conformal LINAC treatment techniques are being developed and implemented, which will further boost the entire field of radiosurgery by offering even more conformal dose plans for irregularly shaped lesions. In addition, LINAC systems are also being adapted for stereotactically focused fractionated radiotherapy and for stereo-tactic radiation treatments in other parts of the body [13, 14, 44, 137]. There is no doubt that the histological determination of a brain pathology remains to be a basic necessity prior to any therapeutic intervention. Knowledge of the exact histology allows better predictions of the prognosis of intracranial lesions, to name only one advantage. Stereotactic biopsy is indicated in the vast majority of detected intracranial lesions, if not otherwise defined. Notably, novel, more sophisticated imaging techniques enable the detection of intracranial pathologies at earlier stages. Consequently, microsurgical approaches in order to reduce intracranial masses are required less [5, 7, 12, 27, 32, 36, 55, 83, 108, 110, 111, 147]. A retrospective analysis reviewing 5000 stereotactic interventions between 1990 and 2005 demonstrated a diagnostic sensitivity of more than 95% and an overall complication rate of < 3% . This stresses the growing importance of accurate stereotactic techniques, which allow a safe and secure proof of pathological features. Moreover, stereotactic principles were the basis for the development of modern neuronavigational procedures, providing less invasive approaches. Today radio-surgical techniques, representing minimally invasive treatment options, are of specific interest to operative neurosurgeons. Taken together, it is to be expected that navigation and stereotaxy will become "reunified" in the near future [24, 48, 71, 96, 133]. Brain metastases occur in one third of all cancer patients. Without any intervention, the prognosis is quite poor with a median survival of only one month . Notably, there is an increasing incidence of brain metastasis as a late complication of extracerebral tumors. Due to the recent improvement in the efficacy of radiotherapy and chemotherapy for primary tumors, today those metastases commonly determine the individual prognosis [1, 34, 43, 77, 103, 115, 134, 135]. The constraints of the blood-brain barrier limit the intracranial efficacy of most chemotherapeutic agents limiting treatment options to surgery, whole brain irradiation, or stereotactic irradiation . As previously mentioned,, in recent years the accuracy of imaging techniques has been steadily improving, enabling the detection of metastases at an earlier stage and at a smaller size. With less morbidity and mortality as compared to open microsurgical procedures, the non-invasive concepts of radiosurgery provide an important therapy option for patients with few lesions. (Figure 1) [2, 26, 52, 57, 109, 148]. Stereotactic radiotherapy of a single brain metastasis. A: Visualization of the target volumes for the treatment of a single intracerebral metastasis of a carcinoma of the lung (58 y old female, Adeno-Ca, pT2, pN1 (2/8), cM1). A 3D-reconstruction displaying the metastasis (violett) and proximate sensitive structures (bulbus and tractus opticus = green and pink; brown = brain stem). B: Visualization of photon beams for the target volume based on planning CT applying stereotactic frames. Surrounding isodoses account for 90 percent at 20 Gy. Margins can be reduced to a minimum with regard to the possibility of exact patient positioning. Alternatively, the interstitial brachytherapy with temporary I125 seeds represents an additional option for patients suffering from a single metastasis. The implantation of the seeds can be performed immediately after confirmation of the diagnosis in the operating theatre in a single session procedure. Usually seeds are left in place approximately 25 days and are removed under local anaesthesia [6, 31, 33, 92, 101, 111, 128]. For patients with malignant glioma clear survival advantages have been demonstrated with postresection external beam radiotherapy. However, there is Level IIII evidence that the use of a radiosurgery boost followed by external beam radiotherapy does not confer benefit in terms of overall survival, local brain control, or quality of life as compared with external beam radiotherapy alone. Notably, radiotherapeutic doses escalating 60 Gy have been shown to solely increase toxicity [9, 11, 20, 30, 35, 46, 107, 113, 140, 140]. Neverthless, for these patients the total resection of > 90% of the "visible" tumor masses, which is defined by contrast enhanced T1 weighted MRI, is a prerequisite. Any further "cytoreduction" in terms of incomplete resection remains out of evidence for outcome and survival. The inefficiency of current treatment modalities is derived from multiple factors, including the diffusely infiltrative nature of the disease, which limits a complete surgical resection, the difficulty in overcoming the blood-brain barrier with systemic therapies, and finally the extreme radioresistant biological nature of malignant glioma cells. Once more the histological proof of a malignant glioma is mandatory. The current standard treatment consists of external beam radiotherapy combined with concomitant and adjuvant temozolomide chemotherapy with respect to clinical and social conditions. The combined and adjuvant administration of temozolomide has been proven to be beneficial in terms of survival in newly diagnosed as well as recurrent malignant brain tumors [10, 17, 19, 25, 39, 41, 56, 61, 72, 89, 91, 95, 117, 143, 152]. Patients with large tumors causing brainstem compression should be initially managed by a surgical decompression of the tumor. Finally, several new promising targeted agents are being explored as potential radiosensitizers, which are currently entering early clinical trials . Due to the poor risk-benefit ratio, many lesions of the brainstem are not being considered for microsurgical resection. Stereotactic biopsies are considered the safest and most reliable method for the histological diagnosis of intraaxial brain stem lesions. Keeping in mind the broad variety of possible neoplasias, the definitive pathological diagnosis permits the choice of the most adequate therapy. In a series of 50 patients with infiltrating tumors of the brainstem, 30 cases were histologically diagnosed as low-grade astrocytomas, 13 cases as high-grade astrocytomas, 2 cases as primitive neuroectodermic tumors, 2 cases as rhabdoid tumors and 1 case as an ependymoma, and 2 patients with non-specified tumors. No mortality due to stereotactic biopsies were reported . In the majority of the patients the histological diagnosis led to a therapeutic intervention. Thus, due to the low risk of the procedure, a stereotactic biopsy should be performed in all cases. The radiosurgical treatment of a brainstem lesion might offer a promising non-invasive treatment which is not associated with severe surrounding oedema [27, 74, 75, 80, 149]. Historically, external beam radiotherapy has been and is still being extensively applied in the treatment of malignant and aggressive intracranial tumors and its important role has been repeatedly verified by improved patient survival and increased tumor control rates. As more modern therapies are being employed in surgery and radiotherapy, attention is now also being directed towards the utility of radiotherapy as either primary or secondary treatment of benign primary brain tumors and meningeomas. Primary tumor treatment encompasses the irradiation of small benign tumors without bioptic confirmation of the histological tumor type. Secondary treatment involves postoperative radiotherapy, with the possibility that less aggressive tumor resections may be performed in areas with a higher probability of resultant neurological deficit. Recent studies suggest that this is not only a possible treatment strategy, but that it may be even superior to a more radical resection strategy in selected cases [37, 45, 49, 87, 99]. Stereotactic radiosurgery is typically employed as first line treatment in patients with small to medium size tumors (without symptomatic brainstem compressions). Furthermore, it is also applied to control the growth of recurrent or residual tumor after surgical resection. 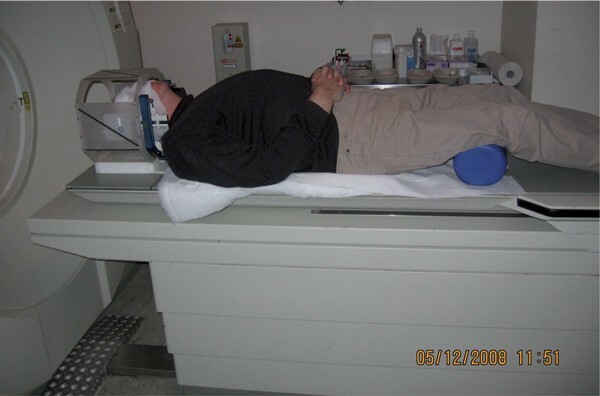 However, stereotactic radiotherapy, which represents a non-invasive, hypo-fractionated treatment strategy, may also be especially suitable for patients who desire preservation of neurological function (cochlear, facial nerve) and a high rate of tumor growth control. Notably, a local tumor control rate of up to 95% (5y FU) can be achieved [37, 81, 131]. Meningioma control rates range from 90 to 95%, and the risk of morbidity is low [38, 40, 84, 93, 104]. The Marseille SRS experience included 1,500 patients, with 1,000 patients having follow-up of more than 3 years. A long-term tumor control rate of 97%, a transient facial palsy of less than 1%, and a probability of functional hearing preservation between 50 and 95% could be achieved in this large series of patients treated with stereotactic radiosurgery [28, 63, 127]. In another large series of a total of 285 patients, a local tumor control of 95% was reported (63% regression, and 32% no further tumor growth). After 15 years the tumor control rate still remained above 90% at 93.7%. In 5% of the patients a delayed tumor growth could be identified. A surgical resection was performed after radiosurgery in 13 patients (5%). None of the patients developed a radiation-induced tumor. Eighty-one percent of the patients were still alive at the time of this analysis with a mean follow-up time of 10 years A. In patients undergoing treatment for acoustic neuromas, a normal facial nerve function was maintained in 95% of patients who had normal function before. Other authors also reported on comparable results [49, 66, 87]. A further indication for radiosurgical therapy in benign tumors is the interstitial treatment of hypothalamic hamartomas with temporarly implanted iodine seeds (also called brachytherapy). These tumors often become symptomatic with gelastic seizures. Schulze-Bohnhage et al. found that 11 out of 24 patients were seizure free or experienced a seizure reduction of at least 90% after a mean follow-up period of 24-months following the last interstitial radiosurgical treatment. Notably, the duration of epilepsy prior to radiosurgery negatively influenced this outcome. Moreover, also seizure-patients who present at younger ages (< 15 y) can be successfully treated with brachytherapy. I125 seed implantation as a radiosurgical technique is predominantly applied for this indication due the advantage of continuous dose application and the possibility of immediate interruption of therapy in cases of side effects, e.g. alteration of the optical tract [4, 42, 73, 123, 129, 130, 141]. Radiosurgery has been proven to be succesful in the treatment of small arteriovenous malformations (AVMs) of the brain [16, 85, 139, 142, 144, 150]. Until now, digital subtraction angiography (DSA) has been a mandatory tool for the planning of these interventions. By integrating different imaging modalities in the planning and follow-up procedure, e.g. MRI, many side effects can be avoided . However, due to the often significant volume of healthy tissue being irradiated in cases of larger AVM lesions, reduced radiation doses would be preferable in order to minimize the rate of irreversible radiation injuries. On the other hand, lower radiation doses lead to lower obliteration rates. Thus, several strategies have been developed in the past decade to overcome these dose-volume problems with larger AVMs, including reduced prescription doses, volume fractionation and fractionated stereo-tactic radiotherapy treatments. AVMs with a volume of ~ > 3 ml can be completely obliterated (obliteration rate 72-96%) , whereas in larger AVMs complication rate and obliteration rate still remain unsatisfactory, especially in AVM's > 10 ml . However, recent optimistic reports suggest a benefit of conventional single-dose stereotactic radiosurgery (SRS). Radio-surgery with marginal dose or peripheral dose around 12 Gy rarely obliterates AVMs and yet most lesions diminish in size after SRS. Higher doses may be reapplied to any residual nidi after an adequate follow-up period [64, 76]. However, long-term data show that some authors retreat the patients with lower doses with lesions that failed to completely obliterate in the first place [100, 121]. Volume segmentation divides AVMs into smaller segments in order to irradiate them separately. Target volumes of only 5-15 ml irradiated with doses of more than 15 Gy can reduce the irradiated volume delivered to the surrounding brain tissue [50, 76, 120]. Furthermore, fewer radiation injuries have been reported with fractionated stereotactic radiotherapy compared to standard radiosurgery [16, 69, 85, 98, 136, 144]. Advances in AVM localization, dose homogeneity and dosimetry and fractionated radiotherapy regimen have refocused the interest in stereotactic radiotherapy. A recently published study of Han et al. on 218 patients with a follow-up of > 2 years provides a focus on the analysis of the radiation injury rate depending on the AVM volume. Investigators dispensed 25 Gy for small (< 4 cm3) and medium size (4-14 cm3) AVMs, and 10 Gy for larger AVMs (> 14 cm3). The overall obliteration rate was 66.4%, 81.7% for small, 53.1% for medium and 12.5% for large AVMs. The authors reported an acceptable complication rate of 1.7%-17.4%, depending on the size of the AVM . The extended latency period between treatment and occlusion, about 5 years for emerging techniques (such as salvage, staged volume, and hypofractionated radiotherapy), exposes the patient to the risk of haemorrhage during that period. Nevertheless, improvements in dose planning and target delineation will continue to improve the prognosis in patients suffering from inoperable AVM's [16, 69, 85, 98, 136, 144]. Especially in the field of functional neurosurgery more indications for radiosurgery are emerging. Successful treatments of trigeminal neuralgia have been reported with radiosurgery of the ganglion gasseri in patients with typical trigeminal neuralgia but also with facial pain due to multiple sclerosis and petroclival meningeomas with infiltration of the trigeminal nerve. Facial pain has become a common indication for radiosurgery with an acceptable rate for hypaesthesia and a meaningful relief of pain in the vast majority of the treated patients [88, 105, 118, 119, 125, 132]. The overall failure rate is about 15%, which is approximately in the same as for decompression. Chen et al. identified preoperative factors which can determine the outcome for pain control: The response to anticonvulsant medication has been regarded as the single most important prognostic indicator for treatment success [3, 23, 53, 54]B[62, 67, 70, 78, 82, 86, 90, 97, 102, 106, 116, 118, 122, 124, 126, 151]. Radiosurgery is enjoying an increasing popularity since the last decade in terms of neurosurgical treatment opportunities but also in terms of treatment options for brain metastases. 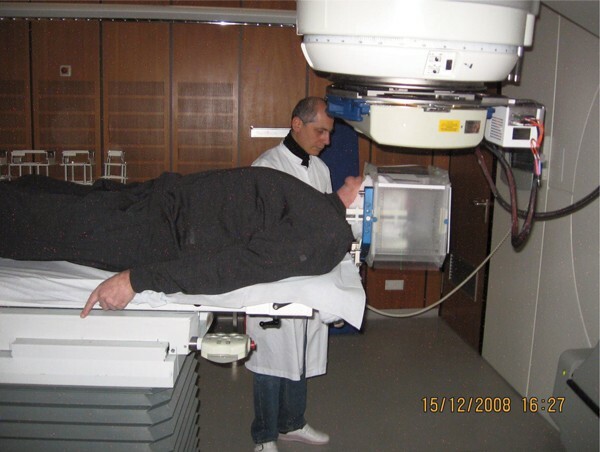 External beam and interstitial radiosurgery have been implemented as commonly applied treatment techniques in radiation oncology as well as neurosurgery due to significant improvements in therapy efficacy, technological safety (smaller multi-leaf collimators), as well as dose homogeneity provided by the newer LINAC generations and newer generation radioactive seeds. Technological advances provide larger treatment flexibility. Apart from the treatment of oncologic processes newer indications also include the management of AVMs and pain syndromes within the functional neurosurgical field. Technological advances in stereotactic neurosurgery not only lead to higher accuracy and safety in planning of both the target coordinates and trajectories (way to the target) but also provide superior and sophisticated methods for defining any intracranial target volume. Correspondingly, current developments in radio-surgery are in part a result of the long tradition of stereotaxy, which today could be considered as an inert component of stereotactic neurosurgery. In conclusion, the technological advances in radiation oncology as well as stereotactic neurosurgery have led to significant improvements in radiosurgical treatment opportunities, which will certainly lead to further expansions in treatment opportunities for radio-surgery. Combining both, the expertise of the long tradition of sterotaxy in the field of neurosurgery and the expertise of highly conformal irradiation in the field of radiation oncology, will certainly yield to further improvements in the treatment success for our patients, while minimizing the risk for irreversible radiation injuries. Patient with mask and stereotactic localizer. J Vesper, E Bölke contributed equally to this work. We would like to thank Ethelyn Rusnak Clinical Assistant Professor, Department of Anesthesiology State University of New York at Buffalo for reading and correcting the manuscript.